Warhammer 40k Forum Tau Online » Games Workshop/40K Related » Showcase » The jaws that bite, the claws that catch! 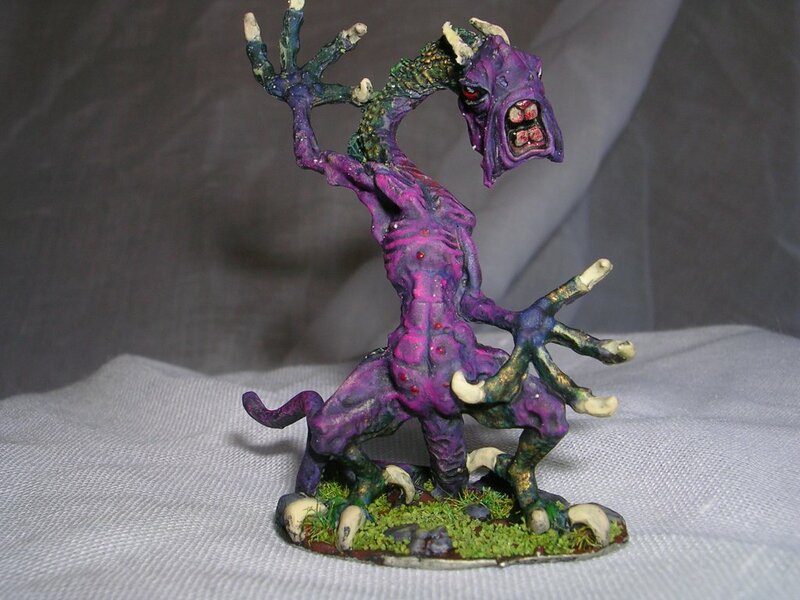 First of all, my apologies if this is off-topic--this is the only "showcase" forum here I could find to post general pictures of miniatures, and I wasn&#39;t sure if pictures were ok in the "other games" section. If this belongs somewhere else, please feel free to move it and tell me where. I&#39;m a complete newbie to miniature wargaming, and haven&#39;t modeled or painted in something like 20 years. So before I started messing up my brand new boxes of Tau, I asked a friend of mine who runs tabletop RPGs if I could practice on some of the random unpainted minis he has knocking around in a shoebox. He handed me some old Ral Partha metal monster, and told me to go to town. I&#39;d already painted a few Skaven that I had sitting around for practice, but I wasn&#39;t really enjoying painting them for one reason or another. So I gave it a shot. 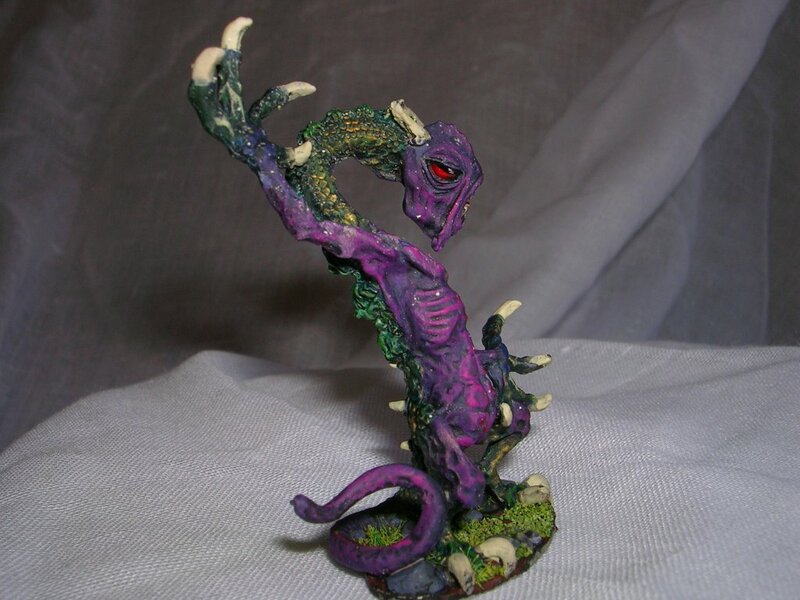 Comments and criticism welcome, though please keep in mind this is only my third miniature--I&#39;ve read a lot of tutorials and sites about painting, but putting all that knowledge into practice, I&#39;m finding, is something else entirely. Some problems I know about: there&#39;s "frosting" in some places because I sprayed on the varnish too heavily. There&#39;s a few pieces of flock stuck to the model that I missed on visual inspection and that got varnished on; I only noticed them after looking at the pictures I took. I missed some spots on painting the base. 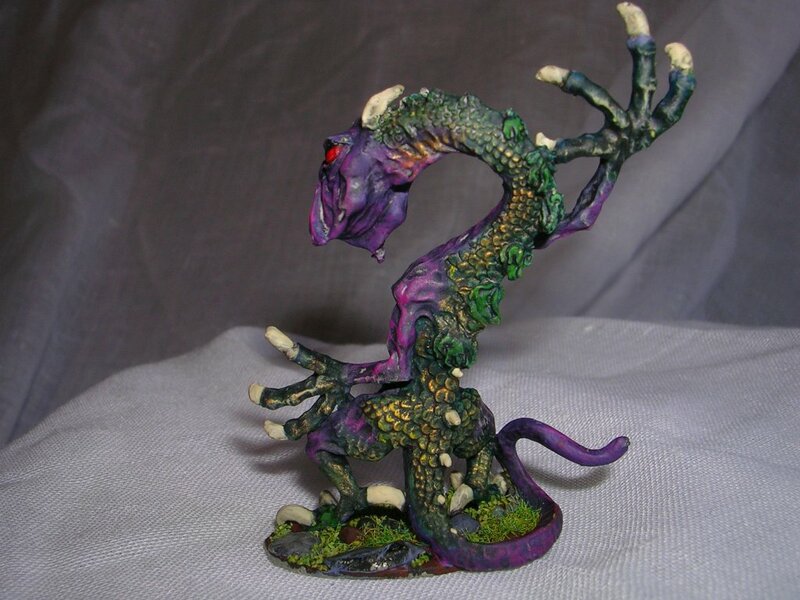 I found some pictures of the original model online, it&#39;s a 1982 Ral Partha Jabberwock. It&#39;s supposed to have wings, but my friend didn&#39;t have them; there was a huge gap on the back that I had to greenstuff into scales and hair. Overall I think it came out pretty well. Re: The jaws that bite, the claws that catch! Just a quick note, you should check your links for those images, as their link names are different, but the target of the link is all the same. So it&#39;s all one picture currently. From what I see, he looks quite nice for only being your 3rd mini ever painted. And yes, reading tutorials and putting them into practice are apples and oranges However, the best tool I&#39;ve found to be, is simply practice. Paint something, strip it, repaint it, strip it, repaint it. Take pictures to keep a documentary of it, so you know how you&#39;re progressing and you&#39;ll see big changes! Another thing--always take a pic of your mini and look at it out of context. You&#39;ll find all the mistakes and stuff much faster and earlier! Looking foward to your next minis! And feel free to ask questions, and ask Bloodiedfangs too, he really knows his stuff! Whoops. *smacks head* Fixed now. So I noticed. I was seriously stoked about the job I did until I snapped a few pictures and got a look at it in 2048x1536. Still, it&#39;s a gift for my friend, since he was nice enough to let me practice on it, so I won&#39;t be stripping this one. Now, my FWs, on the other hand... we&#39;ll see. I&#39;m finding that they present the same problem I had with the Skaven: getting the paintbrush into some of the tight corners once they&#39;re assembled, particularly where the arms cross over the chest and grip the rifle. I&#39;m thinking that I might have better luck priming and painting some of the pieces when they&#39;re still on the sprue. I noticed that aside from the arms, shields, and aerials, all of the Fire Warrior pieces connect to the sprue at places that don&#39;t get painted and get glued on to something else--the bottom of the torso, etc. I have two already assembled, so I think I&#39;m going to experiment on those and get the feel for the model, and then try painting the others before I put them together. One bit of advise that I can give you in term so of paining many minis that are already assembled (not in pieces): Layers. Basically, always paint the deepest crevice, the most furtherest color to the core of the model. For the Firewarriors, that would be basecoat and then whatever color you want for the fatigues (the cloth between the army and along the arms and side of helmets). Painting that, highlighting that,etc. Then moving to the next level, which is the armor and gloves and helmet. The thing is, as you do this, it&#39;s ok to get paint everywhere, because when you move up to the next level, you&#39;re "higher" up from the previous and you&#39;re painting over any spots you&#39;ve created. Eventually you&#39;re on the furthest level, which is usually the gun and any highlights on extremeties of the mini. When you do this across an entire squad, it may take a day or more, but you can get them all done and they&#39;ll all look exactly alike in terms of quality. IE: Basecoat all 12 firewarriors. Next, paint all the fatigues the same base color on all 12 minis. Next, paint the highlights on the fatigues on all 12 minis. Next, paint the base color of the armor on all 12 minis. Then paint the armor again to smooth it out or make it darker, whatever you prefer, tweak the color. Then highlight your armor on all 12 minis. Then clean up anything such as drips etc. Next go to the next level, and start with the extremeties such as weapons on all 12 minis. Base all 12, color all 12, highlight all 12. Then when you&#39;re finished, do the detail work (such as gemstone effects for eye pieces or sights, regalia, etc). Then do the base last (ie, gravel, grass, steel, etc whatever you choose for your bases). If you do this a few times, you&#39;ll get really fast and you&#39;ll produce great minis in great speed and it will be motivating. Trust me, painting 100+ models to look the same may be exciting for the first 10, but the other 90 become hard to do. 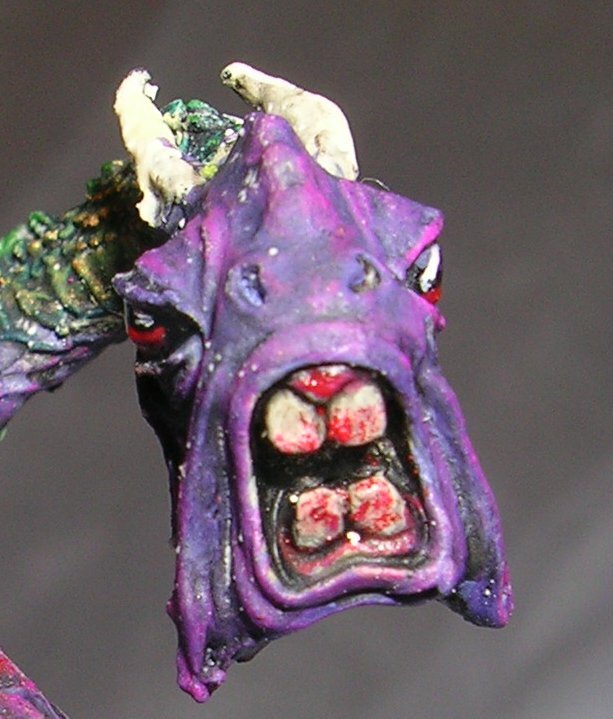 Just little bits like that can really make a difference in painting. It makes for a really high quality look, instead of going from black to bone right away (that will look patchy and transparent). Also, color choice is extremely important. Colors that just don&#39;t match never look good on minis together unless they&#39;re tied together. Now me, I&#39;m colorblind to red/green/blues so I use a color wheel with names (which you can search online via google, they&#39;re free) so I know which colors are complimentary and opposites. Opposite colors will be very striking and nice for an impressive look (like armor). Complimentary colors are better for matching minis without making them striking (like red & yellow is complimentary and looks great together, versus blue and yellow are opposites and look good too, but are VERY striking to look at). So these little concepts can make a big difference in your mini. An example of applying that, is to make your firewarriors armor really striking against the color of his fatigues. Or making his weapon really stand out from his armor. Another example, is to really make a striking difference in the helmets of your leaders of your squads, via opposites to make a striking but very nice difference. Another example, not for Tau, would be to use opposites to make a power weapon really striking, versus the rest of the mini which may be very complimentary in it&#39;s colors. So anyways, just rambling on. Feel free to ask away if you have any questions, and I&#39;ll be more than happy to give you photo examples of anything I&#39;m capable of! Just to give you reference of my own work, if you haven&#39;t already seen any of it, here&#39;s a few links to take a look at: example I, example II, example III, and some older paints from long ago to show progress, examples IV. That makes a lot of sense. I&#39;ve heard that process described in various different ways on various different sites, but it had yet to gel--I think because I was having difficulty applying it to models I actually had. One question--do you generally do the base before you glue them on? So far, I&#39;ve found I have difficulty getting glue, paint, and flock/grass everywhere it should go when I glue the legs on first, and end up with little gaps in the crevices. I think trying to paint the squad this way will help in one other respect: paint usage. I use Vallejo paints, partially because of the pigment and mainly because of that wonderful eyedropper bottle. Unfortunately, when I&#39;m working on one mini at a time, I end up only needing to dribble out a couple drops at a time, and that dries up really quickly, even with watering. Much gets wasted if I&#39;m just working on small details. It would probably make my paint go further (and make mixing easier) if I needed to use more at a time to do more models. Although, doing it this way means I need to have a good idea beforehand of what color scheme I&#39;m going to use, and more importantly, what colors I&#39;m going to need to use--and how--to achieve that. Admittedly, my first few minis were very haphazard, and I went through a lot of coats of paint just experimenting. I&#39;m pretty sure I want to use some kind of a cold or bluish grey. In fact, what did you use on the chestplates of those pathfinders? That&#39;s a really nice color. Beyond that, I&#39;m not sure. From what I&#39;ve seen, Tau color schemes generally seem to fall into several different types: Real camouflage, faux camouflage, dark and light, and panel colors. Real camouflage attempts to actually be functional camouflage. I&#39;ve seen some fantastic work in this, and I&#39;m sure for some septs and/or campaigns it&#39;s appropriate, but not for me. For one, I&#39;m just not good enough to attempt it. It also doesn&#39;t fit with my view of the Tau: with their reliance on technological wonders and high-tech scanners, I don&#39;t think they&#39;d usually put much stock in the usefulness of camouflage--and where they do, it&#39;s the adaptive optical kind like in the Stealth Suits. Faux camo is where you have something that looks like camo, but either wouldn&#39;t work as such or is obviously just there for a pseudo-military look. I&#39;m thinking of the Dal&#39;yth army on the inside cover of the Codex. Also not me. I&#39;m starting to think that dark and light is less of a color scheme than a technique, from what you&#39;ve described. Although, there does definitely seem to be a school of thought in Tau painting that calls for bright armor over dark undergarments. And then there&#39;s the people who just pick some colors that look good and alternate them over the many panel lines in Tau armor. Can look good. I&#39;m almost certainly missing something, but that&#39;s been my observation thus far, anyway. Chances are good that I&#39;m going to go with a dark and light scheme--the visual contrast is just really striking when it&#39;s done right. I don&#39;t want to go with stormtrooper Tau, much as I like the look of the white armor. Admittedly, I can&#39;t bring myself to picking someone else&#39;s color scheme and copying it. I have to be different. It&#39;s genetic. Hm. Suddenly have ideas. Must go play with web site. This is very subjective. For really detailed works, generally from my knowledge, the base is done separate from the mini all together (the mini remains pinned to a vise to be painted, while the base is done separately for example). 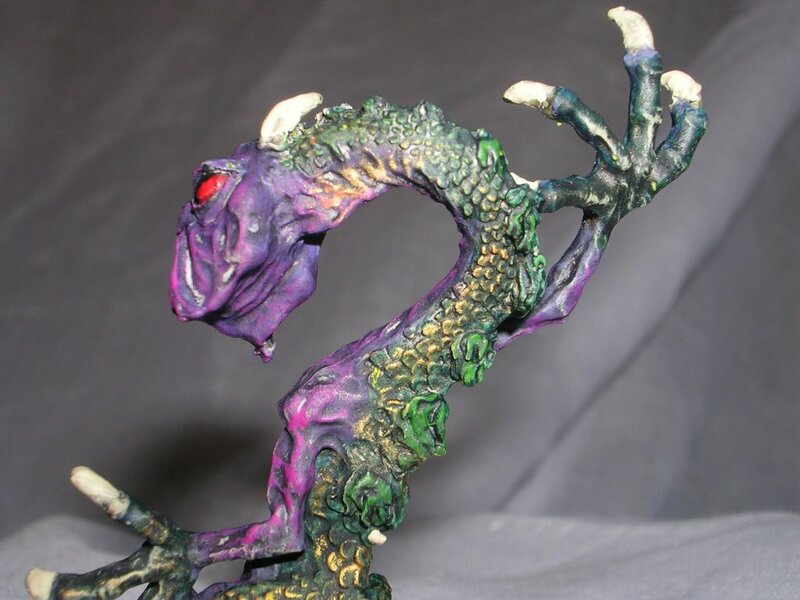 However, I personally do the base after the miniature is painted and mounted to the base, because I just let the glue seep into crevices and flock away. Otherwise, I make a putty base, then put my miniature into it so that I can build around the bits I want to. But that&#39;s just me. That&#39;s the idea. It saves time (you don&#39;t lose hours on a single mini by having to wait for it try dry, touch up, etc) and it saves LOTS of paint. If you paint a single mini at a time, you&#39;ll use probably twice the paint, if not more to accomplish that. And I&#39;m a Vallejo user too, and I don&#39;t know about you but dropping $5 on a new dropper of the same color after doing 12 bottles is -not- an option. I like my paint to go as far as possible. Also, if you keep it wet while doing this--cover it when you&#39;re not dabbing (I put a glass cup over my paint pallet where my current wet paint is, to keep the air from passing over it and drying if faster, but you can do whatever works for you). If you always keep adding a tiny bit of water and stir it around good, it will last longer while you paint your line up. Another option, is to buy a retarding agent which keeps it from drying (but it slows down the dry time on the minis too so it&#39;s not my cup of tea). This is both true and semi-true at the same time. The key is to do an index model. Take a single model and do your total scheme on him. If you like the outcome, apply it to the rest in a line assembly fashion. Otherwise, strip him with whatever you prefer and do it again. You may waste some paint, but if you get the look you want, then you know what you did and you can apply it to the rest of your army (and it&#39;s a good idea to keep pen/paper around to mark down your steps). I always make an index model before I do a bunch of models that are intended to look the same. If it works out, I do the rest the same way or I do them with alteration if it&#39;s a slight enough change to not need to redo the whole thing. That would be prusian blue from Vallejo, I mixed it darker for my base color with 3 parts prusian blue, 1 part black (drops) and diluted with water. That was my first coat of the armor for the dark color and for the dark recess of the divides in the plates. Next was just straight prusian blue only on the middle and outer surfaces, but not in the cracks of course. Next is a mix of 2 parts prusian blue, and 2 parts white. That&#39;s applied simply to the inner most parts or edges. Then finally, a straight white highlight around the outer rims for my own personal taste (I wanted a little white on the edges to tie into the helmet, it gives it an electric and active affect for me). Camo is a very popular scheme, as are codex schemes. I don&#39;t prefer them though. I prefer taking inspiration from color itself. For me, my first Tau were a dark brown with a light bone color for the armor. It&#39;s striking and very bright, but not white. It worked for a while, but now I&#39;m repainting to my new blue scheme (my Tau Police scheme). When choosing your own scheme, think of what you imagine, take a look at various miniature websites, such as the ones listed in the Tutorial stickies (specifically CMON website which has a link in the Tutorial stick at the top of this board). Search Tau and take a look at the various blues, reds, greys, etc that you&#39;ll fine. If one really strikes your fancy you can take the basic idea (read: two main colors) and play with those, or do something similar. For me, I liked the black/blue look, but I didn&#39;t want it that stark--so I went for a more purple blue and a darker grey instead of black for the same general idea of color, but a different look altogether, and then offset the darkness with a bright point on the miniature (in my case, it&#39;s my helmets). Play around with that color generator and just see if anything really strikes you, but remember, paint doesn&#39;t look the same of course! This is actually true for virtually all the 40k races and Fantasy combined. It&#39;s hard for us to imagine that the cloth component of an armed soldier is lighter colored or brighter than the hard armor that covers them. It&#39;s human to think this way really since it&#39;s all we have. Afterall, who has yellow fatigues covered by a black hard chest plate of armor? It just looks odd to us and everyone else. The exception is that you&#39;ll find models with light greens or greys, and a darker version of the same color as the hard component (such as guardsmen). It&#39;s hard for us to imagine that the cloth component of an armed soldier is lighter colored or brighter than the hard armor that covers them. Generally true, yes, but... hm. For the undergarments, a light, cool grey. I&#39;m thinking something like a 4:1 of Sombre Grey and some blue or another. For the primary armor color, Imperial Blue. Deep and dark--almost black, but close enough so that I can still use black for shadows and lining. For alternate panels, perhaps something truly standout. Perhaps a mix of Sombre Grey and Imperial Blue, or something else that&#39;ll produce a really striking blue. I&#39;d almost say red, but the grey is too close to white, and I don&#39;t want to do a red-white-and-blue scheme. Will have to think some more. Edit: Gold! Not metallic gold, I want to try to avoid metallics. But a tannish gold not unlike the homeworld color scheme, except a little deeper. That&#39;s my alternate color. Deep blue for the dark, a cold but light greyish blue for the light, and a leathery gold for the splash of color. Will have to see how that ends up looking. I&#39;ll post pics in a few days. Gold and blue varients look great. I definately would avoid red on the scheme you suggested. Dark blue, light grey, and then a red will look odd (the red is too warm for your scheme). But the gold is perfect. It&#39;s warm too, but it&#39;s also distinct enough to be striking. I would look into a very light brown, a medium yellow and a bright yellow and some white for making that up. Brown coat / medium yellow on top / Chestnut ink wash* / light yellow highlight / Chestnut ink wash again* and white shines/optics for the really nice effect. It would look great. And it would look really good with a deep blue with cool grey fatigues. A very royal look so to speak, and maybe a bit Egyptian perhaps. Now, within the Gold, you could use reds to bring it out nicely (such as the eye ports or rank regalia). Thanks a bunch for the suggestions. I&#39;ll have to go pick up some chestnut ink tomorrow (I only have black), and probably a softer yellow, since I have nothing in between Snakebite Leather and Sunburst Yellow. Possibly a blue ink wash as well, for the armor and fatigues.